I haven’t played the Featured Stamper challenge over at Splitcoast in eons so thought it was high time. The stamper featured this week is none other than Miss Ro (otherwise known as Robin). Here’s her beautiful card that I CASED today. 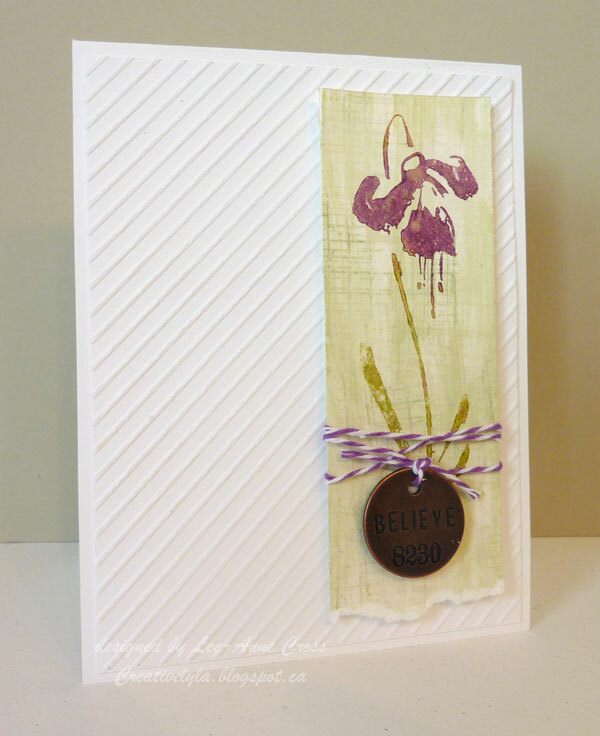 I’ve kept fairly true to her design, using a single floral image and twine, but added the “believe” tag and painted a background for the image with Distress Paints. I streaked some Bundled Sage Distress Paint down a piece of watercolor paper and misted it with water. Then I stamped the “hardware cloth” type image with the same color of Distress Ink randomly on the paper. Next, I inked my stamp with two colors of Distress Paint and stamped the paper. Once that was dry, I sprayed Biscotti Perfect Pearls Mist on the piece for a little bit of sparkle. Just a quick hint…if you stamp with Distress Paint, clean off your stamp immediately after stamping to keep your stamps in great shape. Then I tied a bit of baker’s twine around the strip of paper and added the “believe” token. It’s been attached with dimensionals, as has the rectangular piece to the dry embossed background. Easy peasy…simple as pie! Have a wonderfully creative week my friends! Gorgeous flower image and love the EF you used in the BG. Beautifully done Lee-Anne! Love the embossing and the simplicity! Next Next post: What’s Up?